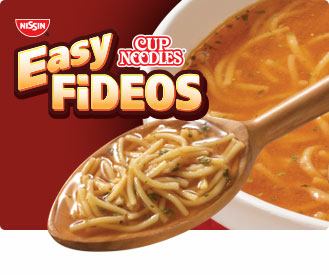 Take the easy route to satisfying your cravings for a soup with a little extra flair. 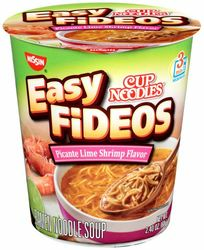 Cup Noodles Easy Fideos pairs our delicious, spoonable fideo noodles with rich, authentic flavors. Ready in minutes, it's a taste sensation you won�t soon forget. Cup Noodles de Fideos Picante con Limon y sabor Camar�n marca Nissin - Caldo de Camaron con Fideos.